This small Franciscan church , built in 1861, contains a slab of chalk rock that according to a tradition was the rock on which Jesus ate with his disciples after rising from the dead. Mark 16: 14: "Afterward he appeared unto the eleven as they sat at meat, and upbraided them with their unbelief and hardness of heart, because they believed not them which had seen him after he was risen". This Franciscan church in Nazareth, built in 1861, contains a slab of chalk rock that according to a tradition was the rock on which Jesus ate with his disciples after rising from the dead (Mark 16). The church is located in a small alley (road #6126), above the church district in the old city (market) of Nazareth. It can be accessed only by foot by a long walk down a steep road (#6139) from the Carmelite Convent, or above the Synagogue church (on road #6126, past the Maronite church). Pilgrims visited the site of the rock from the 17th C and left marks on this enormous rock. The Franciscans initially built a chapel at this site in the end of the 18th C. It was later rebuilt in 1861 and is the present structure. The church was cleaned in preparation for the pilgrims of the millennium. Today it is locked most of the time, but it can be visited. The photo shows the north entrance to the small church. The church is normally locked up. The keys to the yard and to this door are held by the Daniel family across the street, and they are happy to give you the keys for the visit. 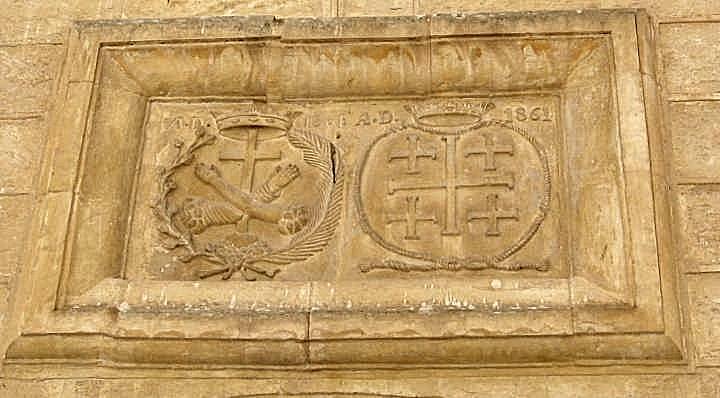 The tablet above the entrance, shown below, indicates the year 1861 when the church was rebuilt. The year is shown on the top-right side. In the right seal is the 5 crosses symbol - the Franciscan's symbol. This symbol was the Crusaders sign of Jerusalem, and was adapted by the Franciscans. It is based on the 5 Holy wounds of the crucifixion of Jesus (2 in the hands, 2 in the legs, and one in the chest). On the left seal are two hands on both sides of a cross - the symbol of the custody of the Holy places. The bare hand is the hand of Jesus, while the hand with a sleeve is St. Francis of Assisi, the founder. Both hands are perforated - the holes created by nails (Jesus on the cross, St. Francis of stigmata). This is the view of the interior of the small church. The slab of rock is the altar, and the painting behind it shows the scene of the post resurrection meal on top of this rock. The following photo shows the slab of rock, which according to the tradition was the table on which Jesus ate with his disciples after rising from the dead. The rock dimensions are 3.6M x 2.7M x 9M. This is a closer view of the chalk rock. On the rock is graffiti of many pilgrims from over the centuries who visited the site. 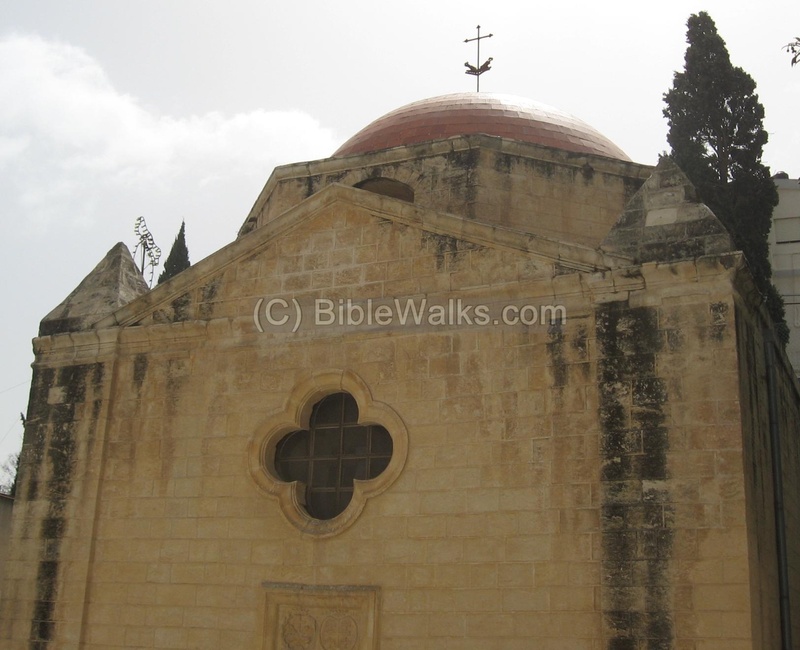 The church is located within a dense neighborhood, on the high slopes of Nazareth above the churches area. This is the view of the alley above the church, which can be accessed only by foot. This walkway is typical to the small alleys in Nazareth and other Arab villages in Israel. In the New testament there are many cases told of the appearance of Jesus after rising from the dead. The following case is related to the meal with the eleven disciples, although similar texts appear in other gospels in other sites in Israel (Jerusalem, sea of Galilee, among others). 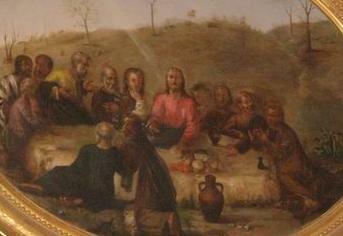 This Gospel describes the appearance of Jesus before his eleven disciples during their meal. According to the local tradition, this happened in Jesus' home town on this site. The following version is KJV; other versions describe a table where they ate. Another tradition places the site of Tabcha as the place of one of Jesus appearances, as per John 20:1 which explicitly specifies the Sea of Tiberias. They shall take up serpents; and if they drink any deadly thing, it shall not hurt them; they shall lay hands on the sick, and they shall recover". Mensa Christi - Latin for the table of Christ: Mensa is a table, and Christi is Christ. El-Balata Church - Arabic: the rock church. The Rock church - another name for Jesus' table church.